The numbers tell the story: Quebec is exporting clean, renewable water power at half the cost of what Ontario Power Generation optimistically estimates will be the cost of electricity from a re-built Darlington nuclear station. And that means Ontario can save more than $1 billion a year by importing low cost power from our neighbour instead of rolling the dice on another costly nuclear nightmare. No radioactive mess to clean up and no massive cost overruns — this brighter solution is right next door. The existing transmission lines joining Ontario and Quebec can carry enough power to replace almost all the electricity currently coming from the Darlington Nuclear Station. With the completion of two new water power generating stations, Quebec’s surplus power for export will be almost double the output of our aging Darlington nuclear reactors. Quebec needs new markets for its power due to competition from natural gas-fired power plants in its existing U.S. markets. 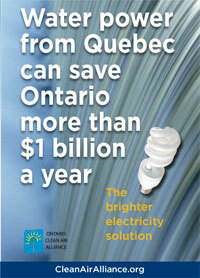 Quebec water power can be combined with Ontario green power to provide zero emission power 24/7 in our province. If you think Ontario should quickly reap the benefits of low cost power from our neighbour, help us tell others about this tremendous opportunity by distributing our new Water power from Quebec pamphlet. We need to make our friends and neighbours aware that Ontario has a much better choice than taking a high-risk gamble on another nuclear project – remember, every nuclear project in the province’s history has gone massively over budget (and this time will be no different no matter what the nuclear industry says). Order our Water power from Quebec pamphlet and let everyone you know in on the secret of the great deal we can get from Quebec! They’re free, and contain postcards to Premier Wynne, making it easy for people to chime in on the energy debate. Click here. P.S. Please go to Premier Wynne’s Common Ground web site and vote for and/or comment on my proposal to import water power from Quebec to lower our electricity bills by more than $1 billion per year. She needs to hear from us! Thanks.